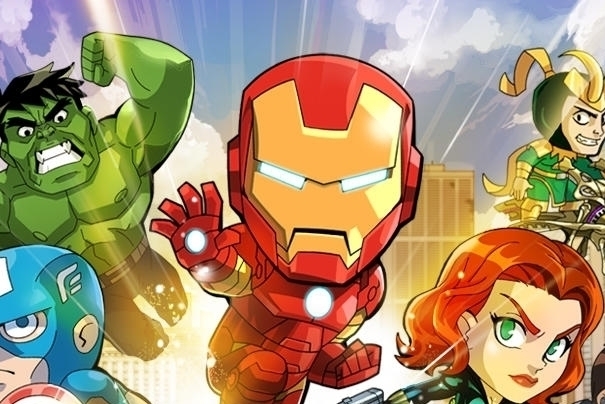 Given the popularity of endless runner games, it was only a matter of time before Disney Interactive gave the Marvel universe a go at the genre. Marvel Run Jump Smash! features a variety of characters from the comic books, including some familiar Avengers favorites, along with a few side characters that fans of the medium will definitely enjoy. Marvel Run Jump Smash! has great gameplay going for it, and it also gives you the option to transform into various characters over the course of the game. You'll be able to utilize Hulk, Iron Man and others as you collect coins and defeat enemies, and the variety they offer really pays off. The graphics are charming, if somewhat unoriginal (the design is definitely inspired by Jetpack Joyride), and being able to choose between Nick Fury and Agent Hill as your main characters - as well as fan-favorite Agent Coulson - is a decent touch. The big problem with Marvel Run Jump Smash! is that it either takes a great deal of time or a deep wallet to unlock everything. You can upgrade your Marvel characters with purchases, but you earn so little gold from each run that the only effective way to get everything is with real money. Considering Thor, Spider-Man and others cost an arm and a leg, that's a real shame. On top of that, not being able to play as the Avengers themselves throughout the game to start is a let-down. Finally, the music isn't really that inspiring, and it plays like background elevator muzak instead of, say, the soundtrack from the Avengers film. Marvel Run Jump Smash! is a pretty good running action game, and has plenty to offer to comic book fans. Unfortunately, it can't overcome the villainy of a rather unfair freemium model. It's worth a try, at the very least.